The smoke one is conscious of is not the smoke of a stream or clouds or billow, and it is not particularly dark. It’s smoke that is like a form of humidity, meaning pervasive, felt ever presently on the skin and in the nose, prickling more than particulate. There was often a smell of smoke in the older India I visited many years ago–one could scent it even when the plane landed–but that smoke smelled rather sweet – of cow dung with, if one was lucky, a touch of cardamom This smoke is edged with plastic, the burn of bottle and bag. My daughter suspects that there’s probably also fair amount of motor exhaust–she has been here few months, and crossing a street, or worse a roundabout, has been one of her major and very understandable fears–but frankly, she can no longer smell the smoke at all, so I’ll call myself the immediate family authority. While I’m sure there’s also exhaust, it’s the plastic that feels pre-eminent. I do not mean to make the City seem unpleasant! The smell is certainly not overpowering, and I’m sure is strengthened by the heat–the hot season has already descended already — over 100 each day–which tends to keep any kind of weighted air close to the ground. It’s just that this burned plastic smell is something that really worries me. I suspect that it pervades many many cities in Asia (and probably in the entire third world). What is especially odd here is that fairly substantial efforts are made to collect and recycle plastic – in part because it is something that poor people can do. At the same time, the concept of “virgin plastic” has become a popular feature of trendy products; that is, products tout the fact that they are not made of recycled plastic. Agh! 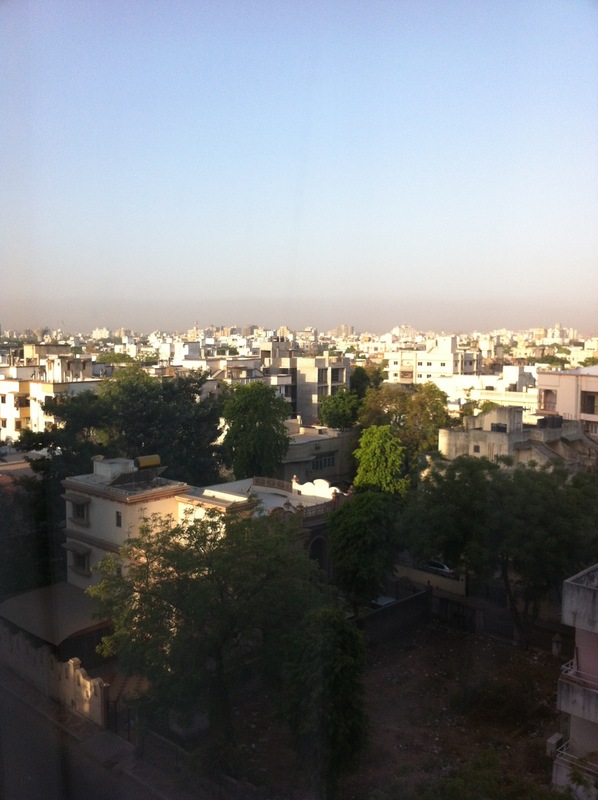 In the meantime, the above is a view of Ahmedabad, this morning, from our hotel window (ironically a Holiday Inn Express). 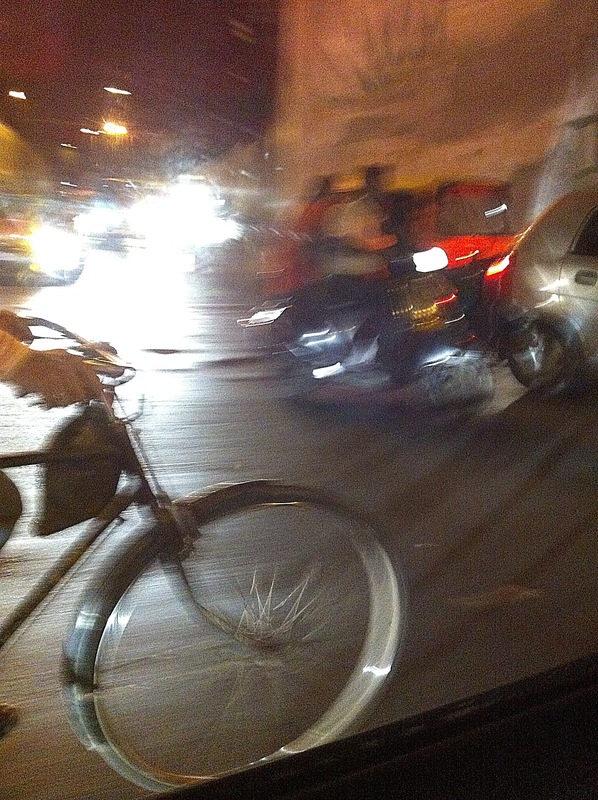 Below is a very blurred picture of traffic. If you look closely, you can see man, wife on motorcycle just behind and ahead of the bike. PS- I haven’t decided how to handle blogging here yet, or writing. I am trying to write a fair amount, but don’t know whether people would prefer immediate sorts of posts or more thoughtful; more personal or more touristic. Oh well. I’m sure I’ll figure something out. On the personal front, my feet hurt terribly – didn’t have time to sandals (even the very old ones I have packed up in some box), and some new online shoes that are not sandals have not worn in -I always have to have some clothing travel glitch, (ii) I should have brought a sleeping sack – a cloth bag–like I always make my daughters bring, and (iii) the food in Gujarat is delicious — very vegetarian and slightly sweet. (Yes spicy.) It is ten and half hours ahead of E.S.T. here. Don’t ask me about the half hour – I think something to do with keeping India on a single time zone. This entry was posted on April 5, 2013 at 8:51 pm and is filed under India, Uncategorized. You can subscribe via RSS 2.0 feed to this post's comments. I found the personal touch of no sandals made this very real and immediate–that’s the sort of thing that always happens when one travels–something minor that turns out to make a major(but hopefully fleeting) impact on your well-being–sore feet are very distracting. I also enjoyed the photos, and the descriptions of the city–burning plastic. Yes, those pesky government regulations are all that keep us from waking up every morning to that and worse. Thanks for finding the time to share whatever you can Karin. Have fun and be safe. So maybe better to just be more real and immediate. I have much to write on the subject of feet. That’s a joke, but probably the personal is more interesting to people. I am someone that hesitates on that level, though it may not appear so. exceptional and revelatory k— feet have a rhythm all their own, Hopefully you adjust there and find new wonders throughout your wandering ~my love is with you. my mouth is watering for slightly sweet, spicy, vegetarian indian food, and I always love to read about feet. Mine are prominent in my daily life (as everyone’s probably are) and your reflections bring on certain empathy. THe “virgin plastic” is a brand new term in my book. Would love to hear updates on what you learn in that arena.